Our Web Guiding System is used for all types of Laminates like, Foil, Paper, LDPE, HDPE, PVC, etc. Our Web Guiding System is manufactured with us most precision which ensure zero maintenance up to 10 years. KEW make Hydro–Pneumatic Web Aligner are the Heart of Hydro Pneumatic Web Guiding System, to automatically guide all type of material of any width, at any speed, under any load. Completely self-contained with an integral air generator for sensor. 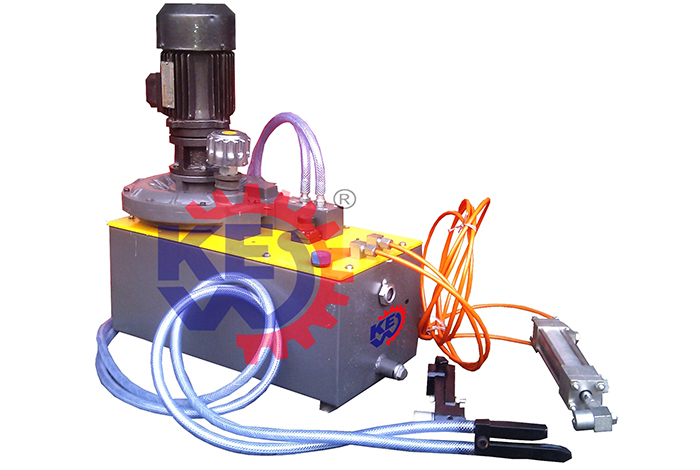 It is coupled with 3 phase AC motor and Hydraulic pump is also attached on the same shaft which is fitted inside the oil tank filled with Hydraulic oil. The signals from the Air flow sensors are received by spool type proportional servo valve mounted just under polyester diaphragm. Unique design gives extremely narrow dead band & fastest possible response for unexcelled guiding results. The power pack units are available in different models from 0.25 HP to 3 HP to meet any guiding application you may have. Web Guiding System for Slitting Rewinding Machine . In-Built Air Generator avoids use of external air supply.